The Montreal Spa is a medium sized fiberglass spa that holds a maximum of 1,925 Gallons. This free form design has less bench seating than the Sydney or Vancouver. However, it still comfortably holds 2-4 bathers in its serene waters. 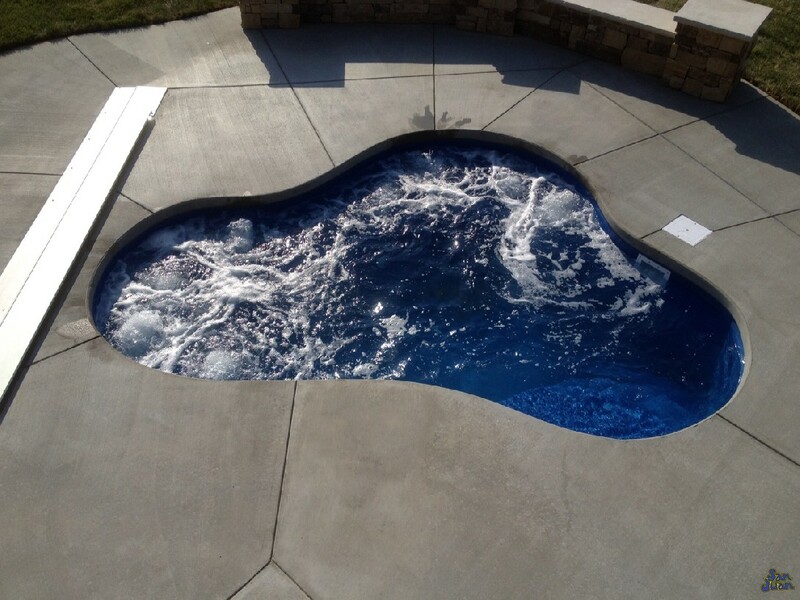 This unique spa shape is perfect for a petite backyard or as an addition to any of our fiberglass pool shapes. 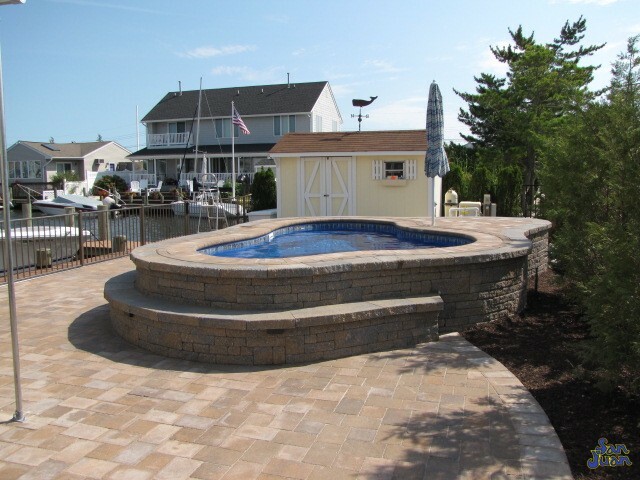 Are you looking for an addition to your existing swimming pool or constructing a new one altogether? Whatever stage of development you are in for your home, you can always benefit from installing a fiberglass spa in your backyard. Our fiberglass spas are renowned for their comfort, design and affordability! The Montreal Spa is no exception and it’s popular for both its shape & moderate size. Slightly smaller than the Vancouver & Sydney Spa, the Montreal holds a maximum of 1,925 Gallons. It also has an overall length of only 15′ 6″ which makes it a perfect fit for a wide range of backyard sizes. Whether you have ample space or are living in an urban neighborhood – chances are, we can work with your allotted square footage. Therefore, let’s take a closer look at this fantastic spa so you can determine if its the perfect spa to bring home to you! As illustrated above, the Montreal is best classified as a medium sized fiberglass spa. Although slightly less than 2,000 gallons it can still easily seat 2-4 guest in its serene waters. This makes the Montreal a popular design for small families, singles or couples. Use it for warm water therapy, relaxing outdoors or even water aerobics – the Montreal Spa is both versatile and beautiful. In addition, the Montreal Spa provides its user with a set of corner entry steps and a flat bottom layout. This allows the user to easily enter and exit the Montreal spa without bumping into other bathers. This truly is a majestic spa that works wonderfully as a stand alone option or paired with one of our fiberglass pool models! In conclusion, the Montreal Spa is a beautiful free form fiberglass spa with a flat bottom layout. It can comfortably seat 2-4 bathers and is easy to maneuver due to its wide bench seating and corner entry steps. You’ll enjoy the Montreal Spa for its moderate size with a maximum water volume of only 1,925 gallons. 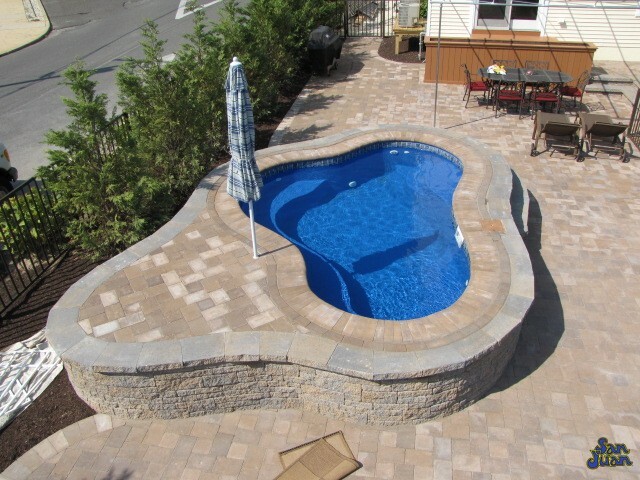 This makes the Montreal Spa a perfect fit for small backyards or as an addition to any of our fiberglass pool models. However you decide to utilize this creative design, it’s certainly going to be a blessing for you, your home and family! 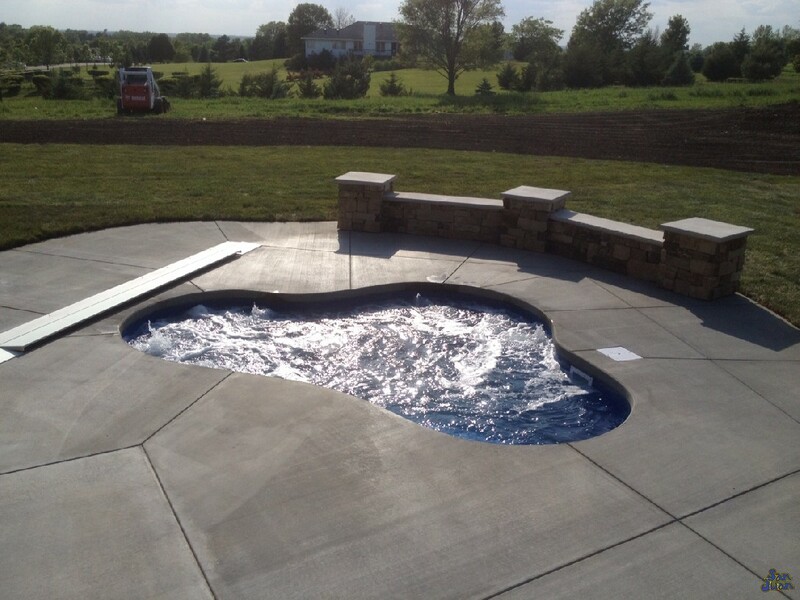 Contact us today for a free estimate and find out if this fiberglass spa is a good fit for you!